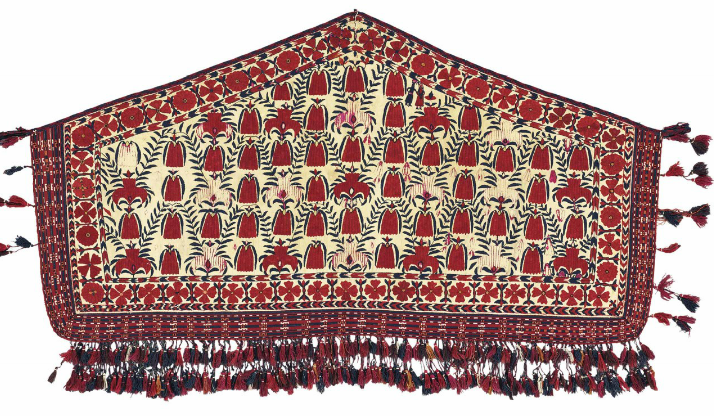 Surviving pairs of embroidered Tekke asmalyks are extremely rare and none have come to auction in at least 40 years. Only singletons have appeared. No Western museum, to our knowledge, holds a matched pair. 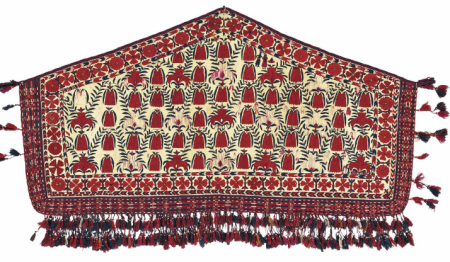 These trappings were made to be hung the flanks of the bridal camel in a Turkmen wedding procession and were woven by the prospective bride for her trousseau/dowry. 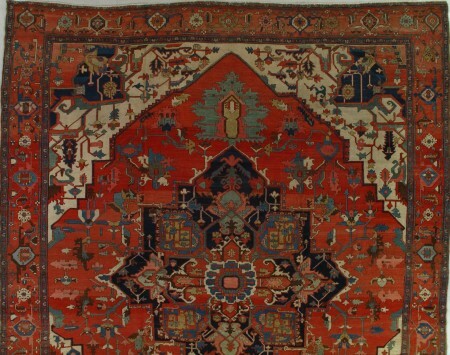 The Tekke tribe ceased weaving pentagonal (or in rare cases rectangular) embroidered asmalyks by the mid-19th century and there are no later examples. The grounds are tightly spun ivory wool in a warp-faced technique with embroidery in wool and pink silk in buttonhole, couching, satin and other stitches. The pink silk was dyed with cochineal or lac, and has proven to be more vulnerable to wear. It has been lost from many of the floral ornaments. There are nine tall flowers with four to six downturned blossoms on each panel. In addition, there is a pair of male and female figures, presumably the marriage couple, on each piece. Human figures are not uncommon on embroidered asmalyks and probably refer to the protagonists. Animals may also appear and they depict the bridal caravan, although they are not present here. All the flowers are in the same style whereas on certain example there are three more important blooms and the rest less complex and secondary. This feature sets our examples off from the majority of the published examples. 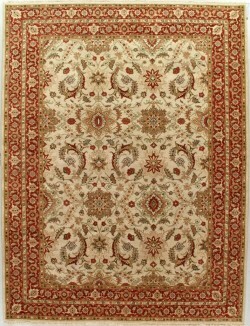 Besides the ivory ground, the detail colours are red, pink (silk), orange, yellow, navy and brown. The main borders do not match exactly, but both employ variants on a quadripartite rosette. The guard stripes are in herringbone patterns. 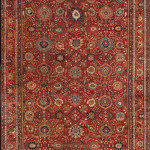 The presence of silk indicates a lavish and costly product, and most embroidered asmalyks are all wool. 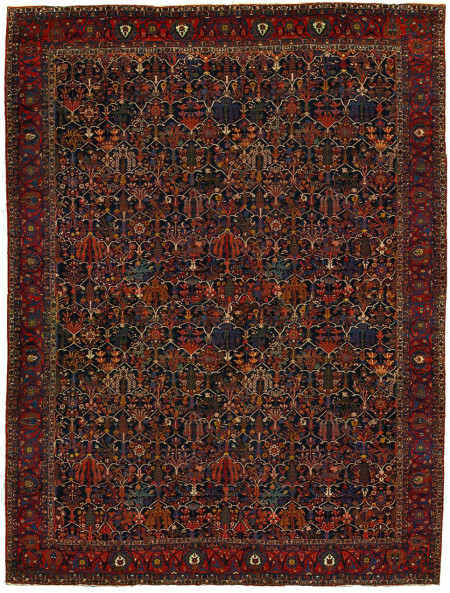 The Tekke tribe also wove pile pentagonal asmalyks in the 18th and early 19th century, but not later. Yomud pentagonal asmalyks are quite common, but always in pile, never in embroidery technique. The striped borders on the sides and bottoms, and the attached tassles, are not original and of later origin. They were added at some point in the relatively recent past and may be removed without compromising the artistic integrity of the pieces.